The University of Pennsylvania (Penn) announced today a collaboration with Johnson & Johnson Innovation LLC to open the first JPOD location in the United States, JPOD @ Philadelphia. The JPOD will be located at Pennovation Works, within the Pennovation Center, the University’s two-year-old full-service business and technology incubator located at 3401 Grays Ferry Avenue. The JPOD @ Philadelphia will serve as a regional resource amplifying the programming and engagement of the JLABS ecosystem by tapping into the existing nexus of science, laboratory and entrepreneurial efforts taking place at the Pennovation Center and the regional life sciences community. The JPOD is a networking hub which includes a secure telecommunications conferencing system to connect researchers and entrepreneurs within the Pennovation Center and region to the Johnson & Johnson Innovation network. The goal of the JPOD @ Philadelphia is to identify and accelerate the development of early-stage healthcare solutions from the region’s life science ecosystem that address significant unmet patient and consumer needs in medical devices, pharmaceuticals, consumer and health technologies. It will also support those innovators with training, mentoring and networking programs to equip them with a mix of resources to help enable their success. Penn Vice Provost for Research Dr. Dawn Bonnell echoes Carnaroli’s excitement for the increased access to global markets that the JPOD @ Philadelphia will afford for the region’s entrepreneurs. “This new regional resource will help translate and advance science and discovery while lowering business, financial and operational obstacles,” she says, “so that companies in the Greater Philadelphia Region can do what they do best, focus on science and bringing innovative solutions to patients.” By providing the platform and programming opportunities for Pennovation community members, Penn entrepreneurs, as well as entrepreneurs across Philadelphia, to interface with this vast network of experts, we envision JPOD @ Philadelphia as a chief conduit for continuing to build the region’s innovation ecosystem. To catalyze the search for entrepreneurs fostering the next-generation breakthroughs in health innovation, JLABS, in collaboration with Pennovation, will launch the JPOD @ Philadelphia QuickFire Challenge. The individuals or teams who submit the most promising solutions will receive an award to further accelerate their innovations. The winners will also have access to educational programs and mentoring from the Johnson & Johnson Family of Companies. The JPOD @ Philadelphia QuickFire Challenge will be launched soon on the Johnson & Johnson Innovation, JLABS website at https://jlabs.jnjinnovation.com/quickfire-challenges. In the coming weeks, additional information about JPOD @ Philadelphia will be delivered to the region. Construction of the JPOD is underway in anticipation of completion this fall. The Pennovation Works is a 23-acre development adjacent to the University campus on the southern bank of the Schuylkill River providing facilities and amenities to bridge intellectual and entrepreneurial initiatives among University researchers, private sector innovators, and start-ups. Owned by the University, and operated by its Division of Facilities and Real Estate Services, Pennovation Works houses research labs from Penn’s schools of Arts & Sciences, Dental Medicine, Design, Engineering & Applied Sciences, and Veterinary Medicine, and companies such as Qualcomm Philadelphia Research Lab, Netronix, and Limelight Bio. It is also the home of PCI Ventures, the new venture development subsidiary of the Penn Center for Innovation (PCI), that provides a wide range of support and services to new companies and entrepreneurs at Penn and the Pennovation Center. 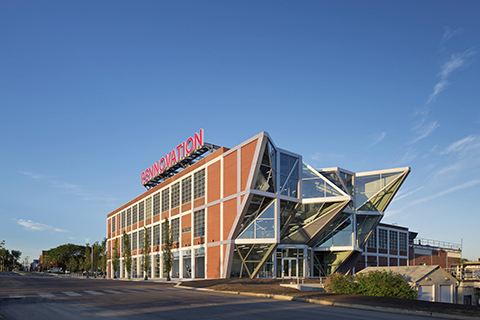 The centerpiece of the site is the Pennovation Center, a 58,000 square-foot three-story facility designed for startup companies, entrepreneurs, and inventors looking to be part of a unique community of innovators, and includes a full service technology incubator; basic wet and dry laboratories; private offices, Inventor Garages, as well as a co-working space for up to 200 members, operated by 1776. Approximately 85 companies and 350 innovators are currently located at Pennovation, where ideas go to work. Visit www.pennovation.upenn.edu and follow @PennovationCenter on Facebook, @PennovationCtr on Twitter, and @PennovationCtr on Instagram. You can also find more information about PCI at www.pci.upenn.edu or by following @PennPCI on Twitter.